1 Thessalonians covers a period from roughly from November of AD 50 to January of AD 51. What marks Paul's ministry in Thessalonica is this opposition from the Jewish community and the persecution and oppression that rises out of that opposition. It is important to understand when we look at 1 Thessalonians because of part of Paul’s primary message there has to do with the reality of opposition, persecution and suffering in the life of the believer in the Church Age. As we look at the epistle in terms of its basic structure and outline, it seems that there are two basic divisions. The first three chapters are very personal and intimate, and they seem to focus around the idea that the apostle Paul is encouraging the Thessalonians in terms of their response to the gospel, that they are indeed believers in the Lord Jesus Christ and this has brought forth evidence that is undeniable of their salvation. Then in chapters four and five we get a focus on the future, on the Lord’s return, and the implication of that for our walk with the Lord. 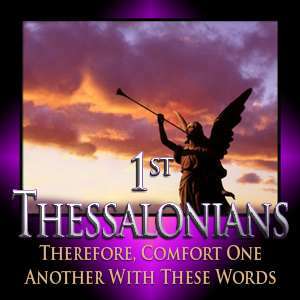 To view all video Bible studies in the 1 Thessalonians series, click here. Are you facing pressure to go along with the beliefs of co-workers, friends, and even family members in the pagan culture of our world? Listen to this lesson to learn how Paul handled the opposition and persecution he faced in the 1st century Roman world. See that he taught that we need to focus with spiritual courage and boldness on the long game and not what’s happening at the moment. In his instructions to pastors and all believers, Paul emphasized that we need to seek God’s approval and not man’s in all that we do. Do you find it hard to tell others what you believe about God? Listen to this lesson to see the importance of boldness and courage when witnessing. See that you will face opposition and persecution. Find out the difference between battle courage and moral courage and the ingredients that make up spiritual courage. Hear about the necessity of listening to the person you are talking to and not arguing with them. Accept that if they do not believe what you are saying you may still be planting a seed that will grow. Continue to seek opportunities to share your faith as you rely on the Holy Spirit and treat those who may be hostile with kindness and caring. Can you name a way that God evaluates believers? Listen to this lesson to learn that God is looking for faithfulness. All believers in the Church Age have a spiritual gift which is designed to function in the local church, in our homes, and in the workplace. Find out how the Apostle Paul saw his ministry and how he first took the gospel to the Jews in the synagogues. See that he met hostility many times which led to riots and danger and suffering. Understand the role of persuasion in presenting the gospel. As we live our lives in the devil’s world, see that it demands spiritual courage as we learn the Word and walk by the Spirit. What is your view of the future? An apocalyptic event as portrayed in movies and books? Listen to this lesson to learn about a coming seven-year period more violent and intense than anything the world has ever seen. Find out that believers will not have to go through this but will be “snatched up” or raptured to Heaven. Hear the evidence for the Rapture occurring before the Tribulation starts. Find out about different views about the timing of the Rapture and the problems associated with them. Hear about the imminency of the Rapture. As a believer, look forward every day to the Rapture in order to be spiritually prepared when Christ returns for the Church. Should we imitate Christians we admire? Listen to this lesson to see what it means to be a follower of someone. See how the Apostle Paul was an example to believers but he pointed out that Jesus Christ was to be our model. Find out the meaning of the wrath of God and the different time frames it refers to. See when it refers to the Rapture. If at times you feel distant from God as if He had left you, ask yourself if you are the one who has moved away from Him. What do you mean saying I shouldn’t get upset? Don’t you see all the awful things that are happening in our country? Listen to this lesson to learn that Psalm 37 tells us not to get worked up over evil and injustice. Find out that we’re to accept that God has everything under control and that, although things may look bad now, God’s plan will triumph and justice will be done in God’s time. The wicked will end up getting their punishment and those who delight in God will receive the desires of their heart. Appreciate that this psalm is written in a deliberate manner with each verse beginning with a letter of the alphabet and its very cadence calms us and helps us stay focused on the assurances of God.